Trench mouth disease, or acute necrotizing ulcerative gingivitis (ANUG) in medical term, is a condition that affects the gums which as its name implies; destroy gum tissues, create sores and inflame the gums. 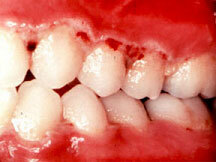 When irreversible destruction of the periodontal tissues has occurred, it will be called as acute necrotizing ulcerative periodontitis (ANUP). The condition is best seen in patients with HIV infection and AIDS and it has been around since World War I (for many of the soldiers in the trenches were affected by it). It used to be called by many names like Vincent’s gingivitis, Vincent’s gingivostomatitis and ulceromembraneous gingivitis. This entry was posted in Oral Care and tagged Acute Necrotizing Ulcerative Gingivitis, bad breath, bleeding of the gums, sore gums, Trench Mouth, trench mouth disease, trench mouth symptoms, trench mouth treatment on October 14, 2009 by oileng.